This Remodeling Project involved the updating of this 56 year old Shaker Heights Kitchen while staying within the existing walls creating one of the more difficult and demanding renovation challenges. Originally built and designed for the “50’s”, the Owner requested that the design allow her and guests to be able to interact during food preparation without physically interrupting the process along with providing a convenient place to do some office work without going to her secluded office. “State of the Art” lighting technology was a top priority. 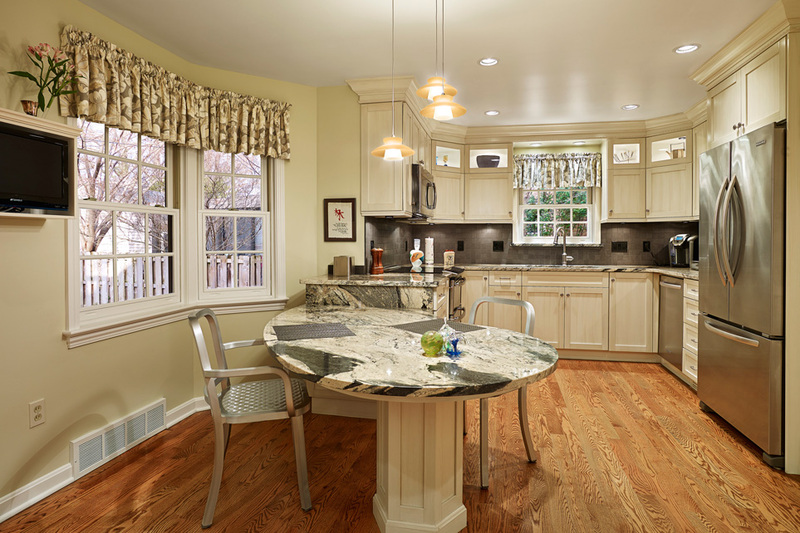 The existing kitchen needed a fresh new design to allow a more spacious look, an entertainment friendly function, and to meet the Homeowner’s work station desire. The challenge was to create all this within a moderately small space while developing an artistically pleasing area for a Breakfast Room. It was necessary to add more artificial lighting into the room and incorporate the new “Building Science Technology.” The existing kitchen was beset with poor features and its knotty pine built-in cabinetry really dated this Kitchen. The design approach had to incorporate a user friendly kitchen and simultaneously serve as the dramatic centerpiece of a spacious and functional floor plan. The existing kitchen was demolished including the knotty pine wainscote paneling surrounding the perimeter of the Kitchen and Breakfast Room. This allowed for a new open space within which to redesign and create an aesthetically pleasing island feature while being able to update the insulation values to today’s Green Technology. Utilizing custom built cabinetry, this allowed to create additional work spaces and storage which was critical. Cabinetry, counter tops, and the peninsula were redefined to create the new kitchen as the focal point. The cabinetry was raised full height which allowed for the illuminated glass display cabinetry which accented the Kitchen beautifully. Additional artificial lighting was achieved by introducing recessed lights for general and over the sink lighting, under cabinet lights and pendant lights over the peninsula and table. Easy access to pots, pans, spices and utensils are now achievable and the natural beauty of the granite surfaces are displayed uncluttered. Even though the appliance locations did not change drastically the updated technology and placement allowed for more counter space and a built in feeling. The peninsula and the table were designed for the client to feel more comfortable sitting at the table while looking out the rear window admiring the picturesque yard. The newly remodeled kitchen now has the “State of the Art” Shaker Heights aestheticism and grandeur. The new lighting concept provides a bright comfortable open feeling during use and a soft ambience when desired. The painted glazed wood cabinetry, the rich movement of the granite counter with the complimenting tiled backsplash and the contrasting hardwood flooring makes this Kitchen look like a showroom with the warmth of home. “For a Home You Will Love”.